I’m delighted to share that my book has been translated into French, and released on February 14th, 2018. Check it out here on Amazon.fr! It has been published in English too, and is available in several countries, including the UK, the USA, Canada and Australia. 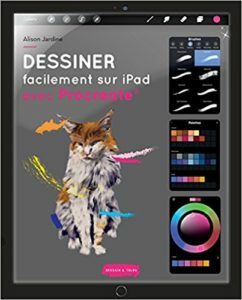 “This book is so much better than anything that I have previously read about making art on your iPad. Most publications seem to start from the point of view that you are an imbecile that doesn’t have a clue about the equipment or software being used, this book assumes that you know how to turn on your iPad and open an app and gets straight to the point of how to make art using the hardware and some representative, artistic software. This is not a step by step, painting by numbers sort of book, rather it is full of information and inspiration that will help you to think like an artist and use your digital media as naturally as you would pencil and paper. Basic art school principles such as colour theory, perspective and contour drawing are discussed along with different themes such as still life, portraiture and landscape whilst genres such as impressionism, pointillism and street art are used in the tutorials. There are 11 chapters, each of which is written in a straightforward, easy to understand way. Excellent colour and black and white illustrations are used throughout the book to provide examples and explanations for each of the topics/projects being discussed. Previous post: Is Painting Dead?